No fancy pictures for now. Got the recipe up to share with a friend. I'll make it pretty another time. Remove the stem from apples. Cut them up into chunks, core and all. Put in large pot with water and vinegar. Boil until soft. Approximately 20 minutes. Using a sieve or medium mesh colander force pulp into a bowl. Measure how many cups of pulp you have. Add sugar 1/2 cup to each cup of pulp. Add remaining spices. Cook uncovered on medium-low for 1 - 2 hours stirring often. It will be cooked long enough when a small amount dropped onto a chilled plate doesn't run. Once it is fully cooked you could refrigerate what you can consume right away and freeze the remaining in small containers. I hot water bath can mine for 10 minutes. 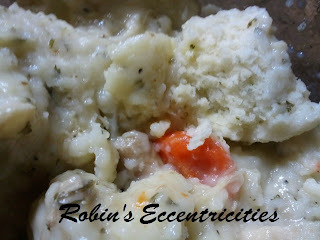 When I moved to a different part of the world in my late teens I was served chicken and dumplings for a holiday dinner. I stared at this odd looking dish that was put in front of me. The dumplings were flat and square! They weren't bad. It wasn't until many years later when my husband made me HIS chicken and dumplings that I realized how good what I consider Southern Chicken and Dumplings could be. If I attempt to make his I wouldn't even try to say mine were as good as what he makes. I also couldn't share the recipe because he has none. 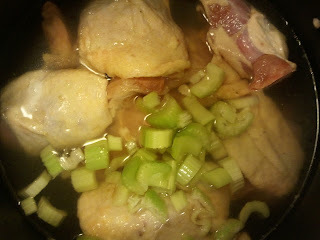 Then there is the next chicken and dumpling recipe. I was at some restaurant somewhere and had this wonderful fluffy herb sprinkled dumplings and my mouth went "OMG These are awesome!!" More years passed without me ever attempting those fluffy little dumplings. These are so easy that I really wish I hadn't waited so many years to try them. If you have a large family it will probably be enough to fill you all up at dinnertime if you add some fresh rolls with it. On the other hand, if there are only a couple of you this recipe will work also. Just freeze half of the broth and cut the dumpling recipe in half. Now you have a half prepared meal ready for later use. Or do like I do and make a double batch of broth and freeze half of it. We have a small family but there is always someone willing to come over and have home cooking. Oops, nope, not quite yet. When selecting your chicken for the base keep in mind that good broth is made with fat that comes from dark meat and skin. OOOOOoooohhh I know, the bad stuff. 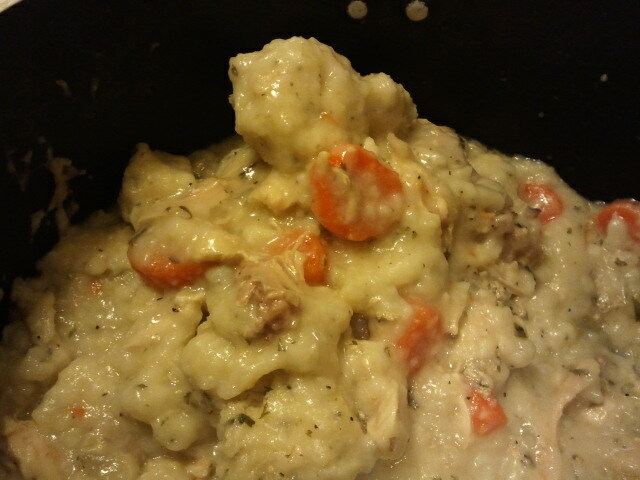 Come on...this IS chicken and dumplings. I prefer to eat white meat but it does little to add flavor. I usually use a whole chicken for the best flavor. Now we'll get to it, after I tell you I did a terrible job of getting pictures today. Too many things going on. That's my story. Okay, just one last thing. 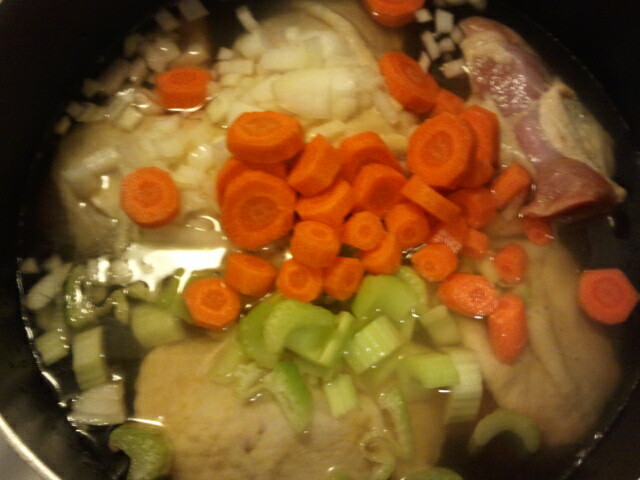 This will be a pot of dumplings with all the other goodies mixed in and very little broth. 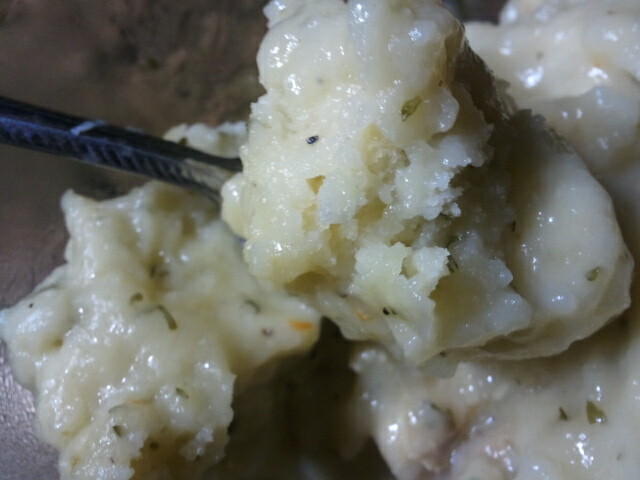 Unlike other dumpling recipes I make these dumplings DO NOT get stirred. 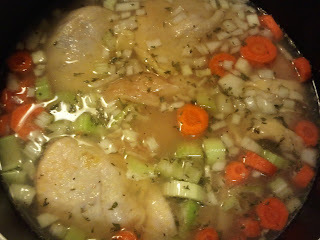 Put chicken in a large pot and add broth. Add the remaining ingredients. 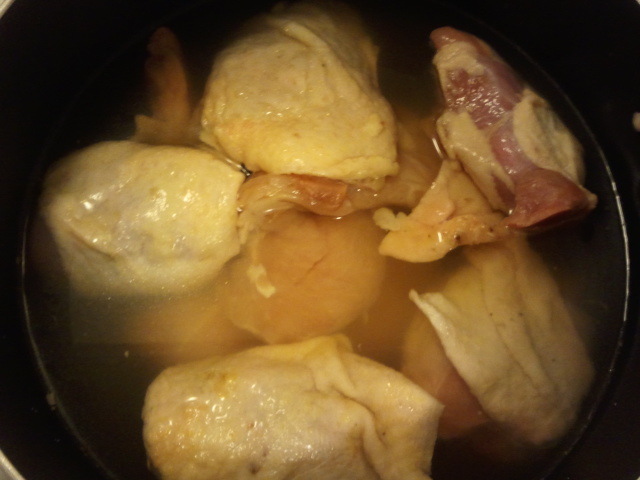 Add enough water to cover chicken by 2 inches. Bring to boil on high heat. Reduce heat, cover and simmer for 30 minutes. Remove pieces of chicken and let cool long enough to handle. 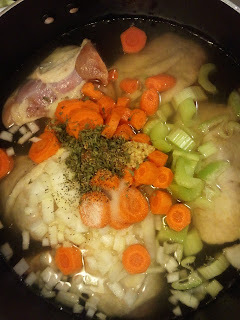 Once cooled remove meat from bones and add the meat back into the broth. Return to boil while making dumplings. Drop tablespoons of the dumplings on top of the boiling broth. Try to keep the size uniform. Once you have dropped all the dumplings bring the liquid back to a slow boil. Do not stir. Cover tightly, immediately reduce heat to low. Do not remove cover. Simmer 15-20 minutes. 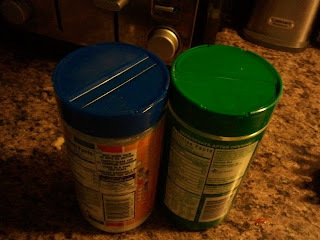 What it will look like when you take the lid off. Gently lift the good stuff from the bottom to mix in with the dumplings. Look at those light fluffy dumplings. YUM! 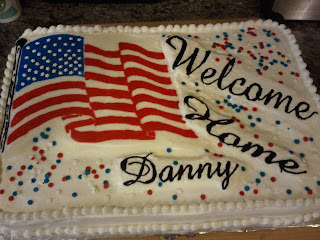 We recently had a "Welcome Home" party for one of our friends that had just returned from a tour in Afghanistan. 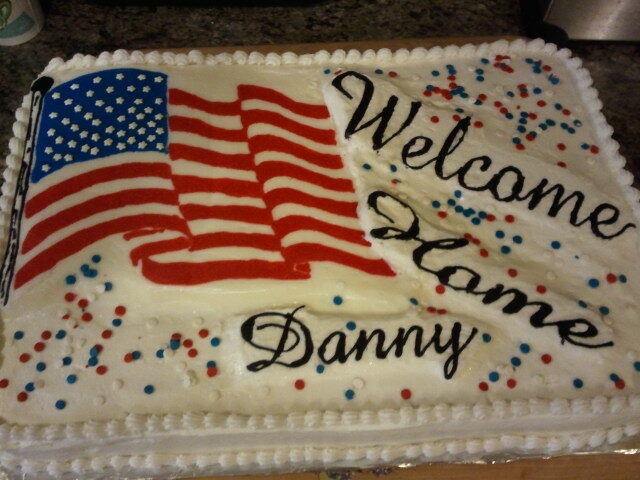 It was also a "Going Away" party for my husband that had recently left the company into a wounded warrior unit. The thing about this group of soldiers is they LOVE their sweet treats. One of the girls in the unit requested a Reese's cake at the party. I wanted to make sure it was over the top and the recipe I found HERE was fit that bill. I also made cupcakes and a sheet cake to decorate. I didn't change it too much and clarified the instructions a bit. 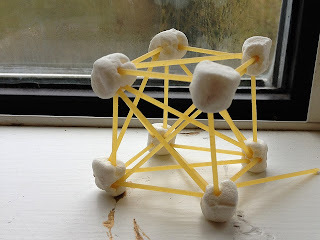 You need to plan ahead for this one but it is not at all hard to make. By starting the day ahead I had plenty of time to freeze the layers and then put it all together. There are 4 different recipes so make sure you go through them all to make sure you have all the needed ingredients. I didn't take pictures through the process, but it is really easy to do. Spray with non stick cooking spray, 2-9 inch springform pans. Line with parchment. Spray the parchment. Melt butter and peanut butter in microwave in 30 second intervals. Mix after each cycle to see if it’s melted. Put in mixer and add sugar. Add eggs and vanilla. Add flour and baking powder. 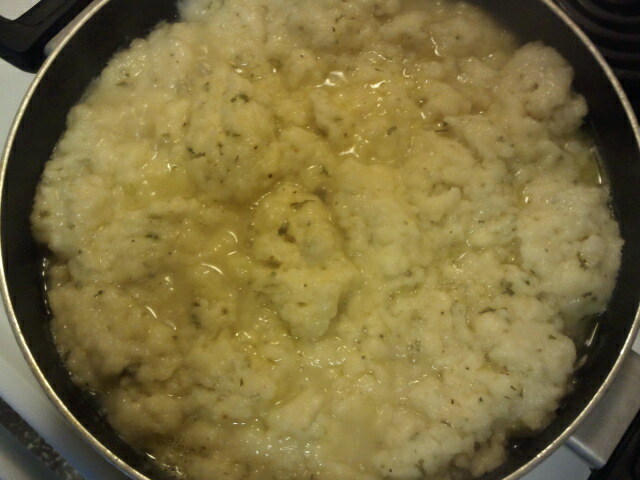 Divide evenly into 2 pans. Bake 35 minutes. Cool for 10 minutes. Remove from pan. Cool completely. Place wax paper between layers and freeze. Preheat oven to 325 degrees. Spray 1- 9" springform pan with non stick spray, line with parchment and then spray the parchment. Cream butter and sugar in a stand mixer. Add cream cheese one package at a time, mix until smooth. Scrape bowl down, continue to beat on medium speed, adding eggs one at a time. Add pudding mix and baking powder. Mix until smooth. Melt the candy bars and Ghirardelli chips in microwave at 30 second intervals stirring after each. Chocolate may be melted but still hold its shape so make sure to stir. Pour the melted chocolate into the cheese mixture and mix until well combined. Make sure to scrape sides of bowl. Pour in pan. Smooth batter as much as possible. Bake for 50-55 minutes. Cheesecake will puff up during baking, and then deflate when removed from the oven. Leave the cheesecake in the pan. Put directly in the freezer until frozen solid. Beat peanut butter, butter, vanilla and 2 cups of powdered sugar. Slowly add rest of sugar alternating with a tablespoon of milk until the desired consistency to spread on. Use only enough milk to make easy to spread. Beat on high until fluffy. Heat cream in microwave for 30 seconds and pour in mixer with cocoa and ¾ cup powdered sugar. Mix well. Add butter, salt, 1 cup powdered sugar, vanilla and whip on high. Set aside. Frost layer with ½ of the chocolate frosting. Remove cheesecake from freezer and carefully remove from pan. Center cheesecake on top of frosted peanut butter layer. Fill center of cheesecake with remaining chocolate frosting. Remove second peanut butter layer from freezer and center on top of frosted cheesecake. Frost the entire cake with the peanut butter frosting. 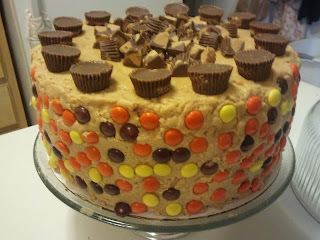 Embellish sides with Reese’s pieces and top with whole and chopped Reese’s peanut butter miniatures. Keep cake in the refrigerator. The cake will be very firm when you cut it to serve, use a strong cutting knife. Find a lot of people to serve this to. Slice as small as possible as the cake is probably one of the sweetest richest cakes I’ve ever eaten. I cut the pieces too large and only a couple of people were able to finish a whole piece. 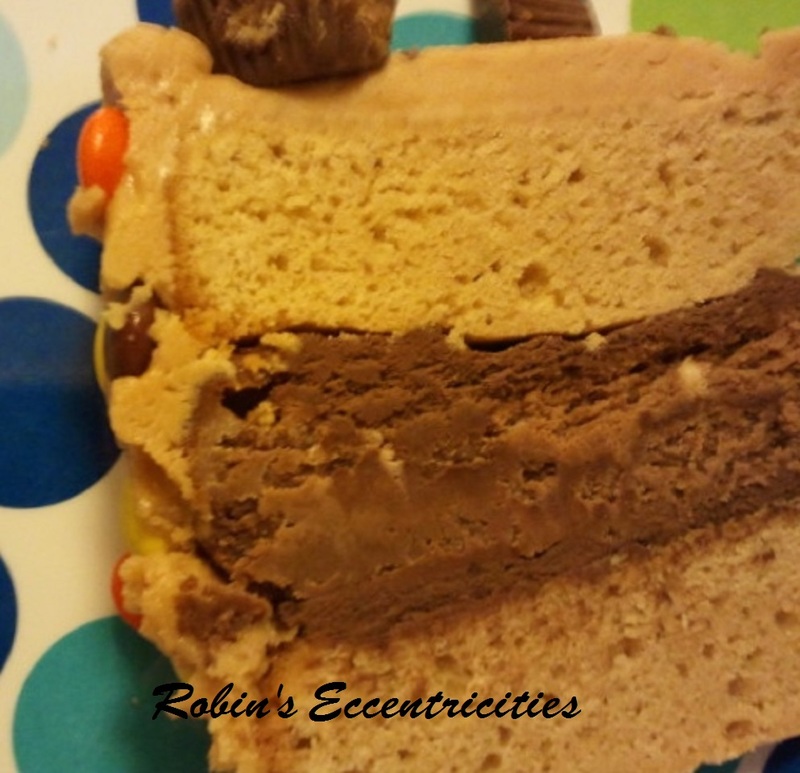 I think next time I make this I will cut the recipe in half and still divide it to make the three layers. Baking times would be reduced. I have been making my own laundry detergent using the same ingredients in the whipped detergent and have been happy with it. The whipped detergent is reportedly better and doesn't use as much. So I decided I would give it a try. You can see the original here from Budget 101. WARNING: If you have lung problems you probably want to wear a mask through the entire process. I didn't and I'm regretting it. I didn't directly breathe in any of the fumes but let's face it, the fumes are in the air when this stuff has to cook for so long. A note regarding using the laundry crystals. These are scent enhancers, not fabric softeners. The original said it was to eliminate the need for softener and I've seen others suggest that too. Just wanted to point out in mine that it is a scent only option. I think next time I will just use lavender oil for scent. 1 bar Fels Naptha, finely grated - No substitutes! 1 cup Washing Soda - NOT baking soda! Measure everything out and have all supplies ready before you start. 1. Finely grate the Fels Naptha. 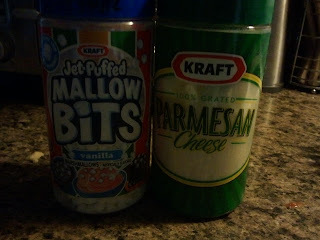 I used an old fashion grater. I don't think the piece of my pinkie knuckle that got grated into the soap will affect the usefulness of the final mixture. (Note: Be careful not to grate your fingers with the soap.) Set to the side for now. 2. Mix Borax, washing soda and Purex crystals in a bowl. Make sure it's well combined. Set aside. 3. Pour the 4 cups of water into large pot and bring to boil. Dump in the grated Fels Naptha and stir constantly. It's going to clump up a bit. Keep stirring and scraping. Make sure to get the bottom and sides of pan as you are stirring. When the water starts to boil again reduce the heat to keep it at a slow boil but not so much it's boiling out of the pan. Keep stirring. When you get tired of stirring, stir some more. Around 15 minutes of stirring and wondering why you even started this the Fels Naptha should be dissolved. You don't want to see any lumps in it. 5. Carefully pour about half of the mixture into one of the quart jars. Using a canning funnel helps. Pour the other half into the second jar. Add warm water (so the jars don't shatter) up to the where the jar starts curving up. Put a lid on the jars and tighten. Turn the jars upside and wait. 6. Soon the mixture will separate into layers. Let the mixture cool until you can hold it. 7. Realize at this point you could skip step 5 by using an immersion blender. Also discover that a hand mixer will either take forever or not work at all to whip to the right consistency. 9. Funnel the whipped laundry soap back into jar. You are now ready to use your whipped detergent. Add detergent after the clothes and use the running water to clean your spoon off. Do not use more than recommended as more does not mean cleaner. This is also not going to suds up and suds are not required to get your clothes clean. Will I make this again? Maybe. If I do I will skip step 5 since it's unnecessary with an immersion blender. This made a horrible mess and I've burned candy that didn't stick as hard to the pan as whatever is in the bottom of this pan did. However, if it lasts as long as it should an occasional mess wouldn't be that bad. Click me to see full sized yumminess. Anyone remember Hardee's? I loved Hardee's and miss them. There are still a few left scattered about the country but they are rare. In our town, Hardee's was a place to hang out in the morning and drink coffee with all your friends. Hardee's had these wonderful fluffy cinnamon rolls that were amazing. Yes, a fast food place actually had something that was THAT good! I've tried cinnamon rolls from other places and they are no where close to the ones I loved. I've had this idea in my head for a while and now I wished that I had tried it much sooner. I knew that the cinnamon rolls had a biscuit like texture and since I love my buttermilk biscuits so much why not make cinnamon rolls with it? So I finally did. AMAZING! After they were finished I tried one and loved them but I don't like to be the judge of my own food so I had to have Mr. Fussy try them. (He might not like me calling him that, but really he is a food snob.) I took one to him and waited patiently impatiently while he took his time trying a bite. There were no words when he took a bite. His eyes rolled back in head and a noise of pleasure came from him. Once he was able to speak he told me they were perfect, the texture and the flavor. So, I'd say this experiment was a success. Try for yourself. Best part is you don't have to wait for hours while dough rises. Oh yeah! Cut butter into chunks to jump start process. Combine flour, salt, baking powder and baking soda in bowl. Cut in butter with pastry knife (or two butter knives held together) until blended. (not mixed) The dough does not have to be uniform and you want chunks of butter because this is what makes them light and puffy. Pour in buttermilk. (the amounts will vary with the humidity.) You want a slightly sticky dough. Keeping everything well floured roll the dough out to an approximately 16x21 inch rectangle. Cream together the softened butter, brown sugar and cinnamon. Spread evenly over the dough. Start rolling long edge. It might be sticky underneath so use a spatula and push a little flour under it as you roll it up. Not super pretty, and very sticky. Bake for 15 to 20 minutes at 425F. While they are baking make your frosting. Mix in powdered sugar until well blended. Continue to beat for several minutes to make it light and fluffy. While still in the pan, drop spoonfuls onto each warm roll and let melt and run down. My husband and I have different opinions on syrup. I want mine warm he wants his refrigerator cold. No matter, we both like lots of syrup on pancakes, waffles and French toast. 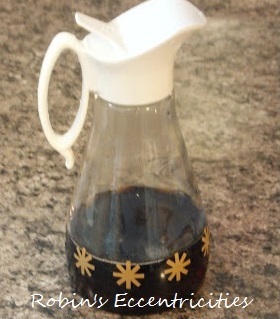 Mom always made simple maple syrup when we were growing up which was sugar, water and the maple flavoring. It is good and if you are lacking all the ingredients it will satisfy that sweet maple flavor we need on our breakfast foods. If you want to spend somewhere in the middle of simple syrup and the name brand butter flavored syrup then this recipe is what you need. This does not make very much syrup. Depending on how much syrup you like and how many you are feeding you may want to double the recipe. Bring to boil for 1 minute. Thickens as it cools. Can be reheated or eaten cold. Store in refrigerator. If you are at a thrift store or garage sale and see one of these they are the best. It's an old Log Cabin brand bottle from the 1960's. They hold a double batch of the syrup.